Support for this website is provided by Chaninat and Leeds, Thai and US Lawyers specializing in criminal defense case. Many people are surprised to learn that the long arm of the law can extend well beyond national boundaries, with people able to be extradited to face criminal charges and serve sentences for even relatively minor offenses, or for breaking laws in another country without ever having visited it. While the majority of nations around the world have signed bilateral extradition treaties with several nations, no single nation has an extradition treaty with every other. As each treaty is an individual document between two sovereign nations, the terms of the treaty are resolved on an individual basis, often requiring lengthy negotiations. (a) A failure to satisfy dual criminality – generally the act for which extradition is sought must constitute a crime punishable by some minimum penalty in both the requesting and the requested parties countries. (b) Politics – most countries refuse to extradite people accused of political crimes. (c) Capital punishment – some countries refuse extradition on grounds that the accused, if extradited, may receive capital punishment or face torture, with some going as far as to cover all punishments that they themselves would not administer. Canada, Macao, Mexico, and most European nations are just some that will not extradite an accused if the death penalty may be imposed, unless they are first assured that it will not be passed or carried out. (d) Jurisdiction – If the accused is a nation's own citizen extradition can be refused to a requesting nation by that country claiming jurisdiction. 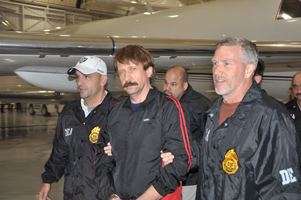 The highly publicized and drawn-out proceedings leading to the extradition of alleged international arms dealer Viktor Bout by US authorities in August last year served to not only highlight the long reach of a country’s legal system, but also that while extradition can be sought by another country, the return of an individual is not always guaranteed. The basis of the extradition request for Mr. Bout involved a sting operation led by undercover US Drug Enforcement Administration (USDEA) agents masquerading as cadre of the Revolutionary Armed Forces of Colombia (Farc), the Crime Suppression Division of the Royal Thai Police (RTPCSD), Interpol, the world’s largest international police organization, and the United States Attorney for the Southern District of New York, Michael J Garcia. On March 6, 2008, Viktor Bout offered to supply weapons to the US DEA agents posing as Farc rebels. Farc is an organization the United States Secretary of State has declared to be a terrorist organization. The Interpol Red Notice, issued by Interpol’s General Secretariat in Lyon, France, is viewed by many Interpol member countries as the basis – though is not mandatory – for the provisional arrest of a wanted person with a view to their extradition. In 2009 Interpol issued 5,020 Red Notices, with the overriding factor being that the application met all of the agencies conditions. The first extradition trial for Mr. Bout began in September 2008, with a ruling on August 11, 2009 by Judge Jittakorn Wattanasi, denying the application on the grounds that the case against Mr. Bout was a political one, and not applicable – a failure under item (b) above. That Thailand did not recognize the Farc as a terrorist organization highlights not only the risk extradition requests can run into, but also a lack of foresight by US authorities in first checking the terms of its agreement with Thailand. Though the Farc were a declared terrorist organization in the US, they were not so regarded by the Thailand government, therefore failing to meet item (a) above, giving a clear indication that such a clause exists in the extradition agreement between the two countries. A subsequent appeal by the Thailand Government saw the lower court ruling overturned and extradition ordered, though a second "back up" set of charges of money laundering and fraud filed by the US Government almost derailed proceedings for a second time when Mr. Bout appealed the extradition order, claiming he couldn't be extradited on the first set of charges while additional charges were pending. With a tight time period set before the extradition order would expire, Mr Bout was brought back before a Thai court where the second set of charges were formally dismissed, allowing him to be handed over to waiting USDEA officers and extradited to the US before the time period defined in the extradition order expired. While the case of Viktor Bout was an extraordinary one, the level of priority the US placed on apprehending him was second only to that for Muslim cleric and Al-Qaeda head Osama Bin Laden. The case adequately demonstrates how complicated international extraditions can be.